I’m thankful for the support, advice, camaraderie (and fan art!) I’ve received from other comic creators who welcomed this little sasquatch experiment with open arms and have, in a very short time, made me feel right at home. I had no idea I’d make so many friends with this. I’m also very thankful for the ever-growing family of readers who are following the adventures of Bigfoot and Scout, commenting on the weekly posts and sharing the comic with others. I really can’t thank you guys enough. So, am I taking some time off for the holidays? I’m not sure. If you don’t see a new page up here next week, assume I’m in a gluttony-induced coma. But I’ve been drawing ’til my hand cramps so, with hope, I’ll have some sort of resolution to this predicament next week. In the meantime, don’t forget to enter the giveaway for the Christmas Sketch Card! Thanks for stopping by. I’d love to hear what you think of the comic. Just remember, Untold Tales of Bigfoot is for grown-ups and kids. So let’s keep the comments appropriate. Sweet Baby Corn I am loving this webcomic series. We can see through Scout’s First Thanksgiving with the family another reason dad wasn’t too quick to turn back and retrieve poor scout. Yeah. Never come between a guy and his turkey. I absolutely love this comic series Vince. It’s just amazing all the awesome webcomics I continue to find, and thanks to twitter I continue to discover more and more everyday. I have some Bigfoot stories I could share but I don’t want to hog up the comment section with those. I do want to say that I’m glad I found your site and look forward to the new adventures of Bigfoot and Scout. Hope you and your family have a wonderful Holiday season. Yay! I was hoping that pooch wouldn’t end up as a Labrea specemin especially when I just found him. Love this page! The ominous shading on Bigfoot & the trees is great! Also, as much as I love me some Thanksgiving turkey, I’d probably be passing some under the table to Scout. He deserves it! Thanks for the feedback, Jeff. And you’re right. 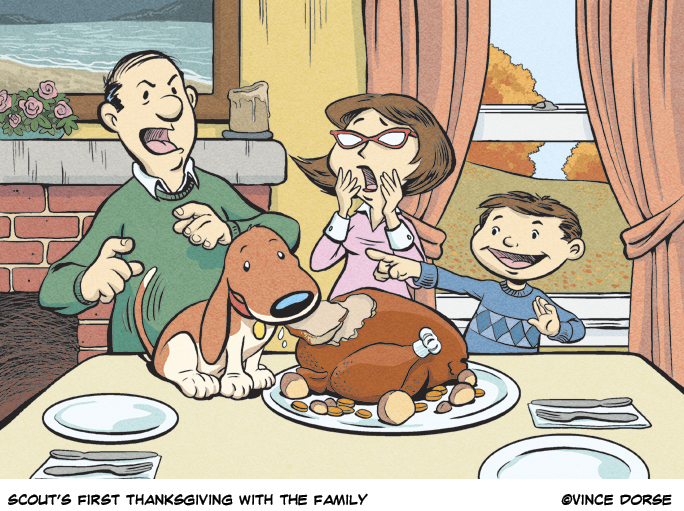 There’s not a person reading this comic that doesn’t think Scout deserves a heaping helping of turkey. Yikes!!! Run away puppy. Oh you can’t can you??? You’ll be publishing page #50 this week, so I decided to go back and look over everything you’ve done so far…and WOW how did I not flip when you originally posted this one??? Amazing! If I had really looked at it the first time around, I would’ve said, “Dorse, you’ve got a Reuben in the bag”. Word up. There is just no pleasing some people. Scout found the thanksgiving food on his first try.